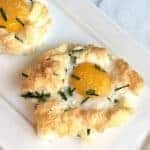 If you are tired of ho-hum eggs for breakfast, the recipe Cloud eggs with asiago cheese & chives come together in just a few minutes, and they taste lovely. Reach for this recipe whenever you have overnight guests or when you just want to jazz up your weekend brunch menu. After 3 minutes, remove from oven and transfer reserved yolks into the indent of each mount. Sprinkle each mound with half of the remaining cheese and fresh chives and return to oven and bake another 3 minutes or until yolks set, and egg whites are golden brown. Remove egg clouds from oven and sprinkle with remaining cheese and chives and serve immediately. *For Best results, reserve the egg yolks in small, individual dishes rather than in one more giant bowl. When preparing Cloud Eggs, it is much easier to add the yolks to the baked egg white “clouds” if you place them in individual containers after separating them from the whites. (If you place them all into a single bowl, they are much more difficult to transfer to the individual “clouds” without breaking). Another tip when making Cloud Eggs: If you don’t want to dirty several bowls or containers, use the larger half of the broken eggshell to hold the yolks while the egg white “clouds” are baking. Place them back in the egg carton or next to each other in a small bowl to prevent the yolk from spilling out, then simply pour them into the individual “clouds” before returning to the oven.Final Cloud Eggs tip: Make sure the indent you create in your egg “clouds” before baking is thick enough. Otherwise, it may disappear during cooking and there won’t be anywhere to place the yolks. Final Cloud Eggs tip: Make sure the indent you create in your egg “clouds” before baking is thick enough. Otherwise, it may disappear during cooking and there won’t be anywhere to place the yolks.